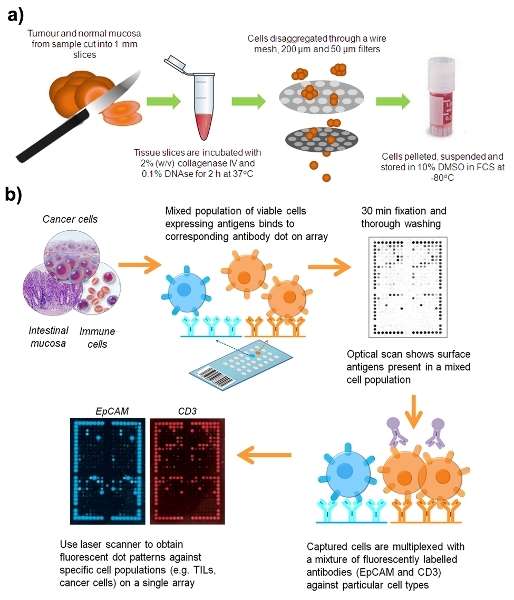 We described a procedure for the disaggregation of colorectal cancer (CRC) to produce viable single cells, which are then captured on customized antibody microarrays recognizing surface antigens (DotScan CRC microarray). Sub-populations of cells bound to the microarray can be profiled by fluorescence multiplexing using monoclonal antibodies tagged with fluorescent dyes. Zhou, J., Belov, L., Solomon, M. J., Chan, C., Clarke, S. J., Christopherson, R. I. Colorectal Cancer Cell Surface Protein Profiling Using an Antibody Microarray and Fluorescence Multiplexing. J. Vis. Exp. (55), e3322, doi:10.3791/3322 (2011). The current prognosis and classification of CRC relies on staging systems that integrate histopathologic and clinical findings. However, in the majority of CRC cases, cell dysfunction is the result of numerous mutations that modify protein expression and post-translational modification1. A number of cell surface antigens, including cluster of differentiation (CD) antigens, have been identified as potential prognostic or metastatic biomarkers in CRC. These antigens make ideal biomarkers as their expression often changes with tumour progression or interactions with other cell types, such as tumour-infiltrating lymphocytes (TILs) and tumour-associated macrophages (TAMs). The use of immunohistochemistry (IHC) for cancer sub-classification and prognostication is well established for some tumour types2,3. However, no single ‘marker’ has shown prognostic significance greater than clinico-pathological staging or gained wide acceptance for use in routine pathology reporting of all CRC cases. A more recent approach to prognostic stratification of disease phenotypes relies on surface protein profiles using multiple 'markers'. While expression profiling of tumours using proteomic techniques such as iTRAQ is a powerful tool for the discovery of biomarkers4, it is not optimal for routine use in diagnostic laboratories and cannot distinguish different cell types in a mixed population. In addition, large amounts of tumour tissue are required for the profiling of purified plasma membrane glycoproteins by these methods. In this video we described a simple method for surface proteome profiling of viable cells from disaggregated CRC samples using a DotScan CRC antibody microarray. 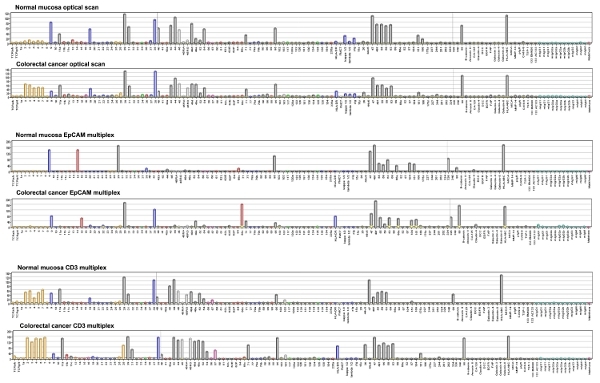 The 122-antibody microarray consists of a standard 82-antibody region recognizing a range of lineage-specific leukocyte markers, adhesion molecules, receptors and markers of inflammation and immune response5, together with a satellite region for detection of 40 potentially prognostic markers for CRC. Cells are captured only on antibodies for which they express the corresponding antigen. The cell density per dot, determined by optical scanning, reflects the proportion of cells expressing that antigen, the level of expression of the antigen and affinity of the antibody6. For CRC tissue or normal intestinal mucosa, optical scans reflect the immunophenotype of mixed populations of cells. Fluorescence multiplexing can then be used to profile selected sub-populations of cells of interest captured on the array. For example, Alexa 647-anti-epithelial cell adhesion molecule (EpCAM; CD326), is a pan-epithelial differentiation antigen that was used to detect CRC cells and also epithelial cells of normal intestinal mucosa, while Phycoerythrin-anti-CD3, was used to detect infiltrating T-cells7. The DotScan CRC microarray should be the prototype for a diagnostic alternative to the anatomically-based CRC staging system. Figure 1. Work flow for preparation of a suspension of live cells from a surgical sample of CRC. All samples were collected from the Royal Prince Alfred Hospital (Camperdown, NSW, Australia) and Concord Repatriation Hospital (Concord West, NSW, Australia) with informed consent under Protocol No. X08-164. Collect fresh colorectal cancer (CRC) or adenoma specimens, and normal intestinal mucosa at least 10 cm from the tumour. Store samples in Hank’s balanced salt solution pH 7.3 (HBSS) at 4°C for up to 12 h after resection. Follow safety regulations for human pathogens, process all clinical samples in a biological safety cabinet class II. Dissect the samples into 2 mm cubes in a Petri dish using two scalpel blades. Incubate tumour and normal tissue in separate Eppendorf tubes with occasional gentle mixing for 60 min at 37°C with an equal volume of RPMI 1640 medium containing 2% (v/v) collagenase type 4 (Worthington, Lakewood, NJ, USA) and 0.1% (w/v) deoxyribonuclease I from bovine pancrease (DNAse I; Sigma-Aldrich). Force semi-digested tissue through a fine wire mesh strainer using a plunger from a 10 mL syringe; wash cells through with HBSS. Pass resulting cell suspension through 200 μm and 50 μm Filcon filters (BD Biosciences) to remove cell aggregates. Most of the DNA, mucus and cell aggregates are removed in this series of filtrations. Centrifuge cell suspensions at 400 x g at 20° for 5 min. Resuspend cell pellets in heat-inactivated FCS containing 10% dimethyl sulphoxide (DMSO), freeze slowly in cryovials and store at -80°. The freezing process tends to reduce mucus in the sample and lyses red blood cells. Thaw out samples quickly in a 37° water bath and resuspend cells in 10 mL of HBSS to wash out the DMSO. Centrifuge cell suspensions at 410 x g at 20° for 5 min. Decant the supernatant and resuspend the cell pellet in 500 μL of HBSS. Treat the sample with 0.1% (w/v) DNAse I for 20 min at room temperature. Mix 10 μL of each cell suspension with an equal volume of trypan blue and load 10 μL of the mixture into a hemocytometer. Using a light microscope at 100-fold magnification, count viable cells, which appear clear due to trypan blue exclusion, while dead cells take up the dye. A minimum 4 x 106 viable cells is required for cell capture on the microarray. Following DNAse treatment, resuspend the cell suspension in 10 mL HBSS and centrifuge at 410 x g at 20° for 5 min. Decant the supernatants and resuspend cell pellets in RPMI 1640 to a final volume of 200 μL. Moisten the DotScan antibody microarray by dipping the nitrocellulose section into phosphate buffered saline (PBS) for approximately 20 s. Carefully wipe the glass edges of the microarray with folded Kimwipes, avoiding touching the nitrocellulose section. Add water to the microarray incubation tray to provide a humid chamber. Place the microarray into the chamber and pipette the cell suspension in RPMI 1640 onto the moist nitrocellulose section. Pipette drops on each corner of the nitrocellulose to ensure an even spread of cells. Incubate the microarrays at 37°C for 1 h. The incubation allows cells to settle and come in contact with antibodies on the microarray. Cells expressing surface antigens corresponding to the antibodies they land on will be captured. After incubation, dip the microarrays gently and vertically into three troughs containing at least 15 mL PBS to wash off unbound cells (20 s per wash). Prepare 3.7% (w/v) formaldehyde in PBS to fix the cells and antibody by cross-linking. Gently pipette approximately 1 mL to cover the nitrocellulose section of the microarray. Incubate for 20 min at room temperature. Next dip microarrays into 3 changes of PBS (15 mL; 30 s each) to wash out excess formaldehyde. Wipe the edges and back of the glass slide with Kimwipes and scan the microarray using the DotScan scanner while, the nitrocellulose section is moist. The optical scan provides the antigen expression pattern of a mixed cell population e.g. CRC cells, leukocytes and other stromal cells of the tumour. Remove the microarray from the scanner and apply 200 μL of blocking buffer (2% w/v BSA, 2% heat-inactivated human AB serum, PBS, pH 7.3). Incubate it in the microarray tray at room temperature for 20 min. Prepare the multiplexing solution in an Eppendorf tube covered with aluminum foil: 20 μL Phycoerythrin-anti-CD3 (Beckman Coulter, Gladesville, NSW, Australia, #IM12824; 1/7.5 final dilution), 10 μL Alexa Fluor 647-anti-EpCAM (Biolegend, San Diego, CA, USA; 1/15 dilution), 2 μL of heat-inactivated human AB serum (Sigma-Aldrich, Castle Hill, NSW, Australia) and 118 μL of blocking buffer. Drain off excess blocking buffer from the microarray and pipette the multiplexing solution onto the nitrocellulose section, spreading uniformly. Incubate for 30 min in the dark at room temperature. Dip the microarray vertically into three troughs of 15 ml fresh PBS; (30 s each). Let the microarrays dry in the dark and store at 4°C in a slide box. The microarray can be stored in the dark for up to 3 months without loss of fluorescence. Scan the dry microarray using a Typhoon FLA 9000 scanner (GE Healthcare, Rydalmere, NSW, Australia) with resolution set to 50 (532 nm laser, 580 BP30 emission filter for PE. 633 nm laser and 670 BP30 emission filter for Alexa 647). The microarrays are scanned with the nitrocellulose side facing downwards on the glass scanner tray. Save the fluorescent images as TIFF files and using Photoshop set image size to 17 x 25 cm and resolution to 72 pixels/cm. Import the image into the DotScan analysis software to analyse the intensity of dots. Microarray heatsmaps and hierarchical clustering were conducted using MultiExperiment Viewer (MeV) version 4.4 from the TM4 Microarray Software Suite (http://www.tm4.org/mev.html). Hierarchical clustering was performed on background-adjusted data using MeV with complete linkage analysis. Euclidean distance was used for similarity measure. The 2-tailed Student’s t-test with equal variance was used to determine the statistical significance of the results. 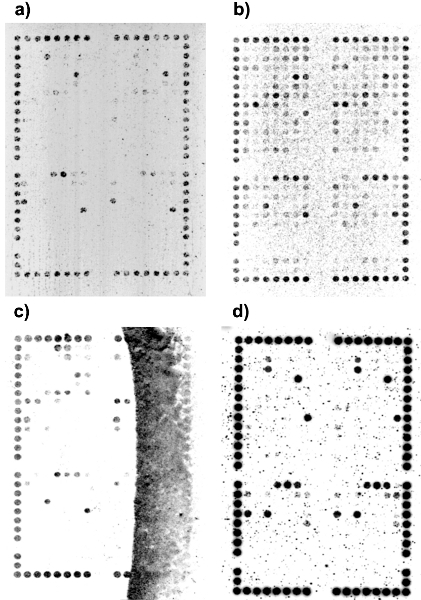 Results from the DotScan microarray should show consistent cell binding patterns between duplicate arrays. Strong alignment dot binding (CD44/CD29) enables a grid to be placed over the array area. Figure 2 shows an example of optimal cell capture and multiplexing. Figure 3 shows some common problems encountered during cell capture and the possible solutions. The microarray cell binding results can be quantified by measuring dot intensities expressed on a greyness scale ranging from 1 to 256. Figure 4 shows numerical data from 58 surgical CRC samples, stained with EpCAM-Alexa 647 antibody, as a heatmap with hierarchical clustering. Even though the number of samples is limited, CRCs of the same stage tend to cluster in the same group. Figure 2. Cell binding pattern of clinical colorectal cancer tumour (Australian Clinic-Pathological Staging, ACP stage B1). (a) DotScan antibody key showing locations of antibodies for the left half of the duplicate microarray (outlined). The top section contains the original 82 antibodies of the DotScan leukemia microarray. An additional 40 antibodies, corresponding to specific surface antigens found to be up-regulated in the literature, were added as a CRC ‘satellite’ microarray. 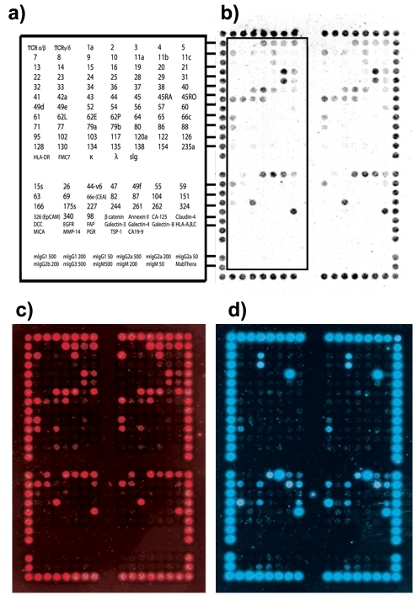 The bottom section consists of isotype control antibodies (b) Optical image of CRC cells binding to the microarray. (c) CD3 fluorescence image showing T-cells. (d) EpCAM fluorescence image showing CRC cells. Figure 3. Examples of poor DotScan results and possible solutions. (a) Low cell binding; solution: make sure at least 4x106 viable cells are on the array (b) Isotype control binding and non-specific cell binding; solution: add heat-inactivated human AB serum to sample before incubation on microarray to minimise isotype control binding. Occasionally, a small amount of non-specific binding of cells to the nitrocellulose occurs with CRC samples and does not significantly affect the results. (c) Nitrocellulose drying out during incubation; solution: ensure sample covers the whole nitrocellulose section and microarray is incubated on a flat surface. (d) High background artifacts; solution: ensure the microarray is thoroughly washed following incubation. Figure 4. DotScan analysis software generated bar charts representing cell binding densities on a greyness scale ranging from 1 to 256. Numbers on the axis refer to CD antigens. Other abbreviations are TCR, T-cell receptor; κ, λ, immunoglobulin light chains; sIg, surface immunoglobulin; DCC, deleted in colorectal cancer protein; EGFR, epidermal growth factor receptor; FAP, fibroblast activation protein; HLA-A,B,C HLA-DR, human leukocyte antigens DR and A,B,C respectively; MICA, MHC class I chain-related protein A; MMP-14, matrix metallopeptidase 14; PIGR, polymeric immunoglobulin receptor; TSP-1, thrombospondin-1; Mabthera, humanised anti-CD20. Click here to view larger image. In this video, we demonstrate how the DotScan antibody microarray can be used in a simple, semi-quantitative way to study surface antigen profiles for cell populations from CRC tissue. Obtaining a viable single cell suspension from tissue is critical to the success of the experiment, because energy-dependent processes (eg., antigen capping and/or pseudopodia formation) appear to be required for firm binding of whole cells to antibody dots during incubation, while dead cells are subsequently washed off. Type 1 collagenase was initially employed for tissue disaggregation8, but was replaced by collagenase 4 which causes less damage to cell membranes, as it contains fewer protease contaminants. This change did not affect cell yield, viability or binding patterns. Mucus from some tumours and control samples reduced cell yield and interfered with cell capture. This stickiness of the mucus was minimized by storage of disaggregated cell suspension in 10% DMSO/FCS at -80°C, presumably due to changes in mucus properties after freezing and thawing9. Subsequently, all samples were stored frozen in 10% DMSO/FCS after disaggregation and were rapidly thawed to produce viable cell suspensions, with consistent binding patterns. Samples with <50% viability or showing poor binding on alignment/housekeeping dots (CD44/CD29 ) were omitted from the analysis. A few antibody clones showed reduced affinity when bound to the nitrocellulose possibly due to a change in conformation, e.g., the prominent CRC marker CD15s had very little or no cell binding. Antibodies that exhibited consistently negative results should be replaced with different hybridoma clones. Another possible cause of poor activity of some antibodies was interference to binding by bovine serum albumin (BSA). BSA-free antibodies should be used on the microarray where possible. Although large patient cohorts are required for statistical analysis of microarray data, hierarchical clustering of our results (58 clinical samples) has been encouraging. Normalization of data using approaches described by Yang10 should provide improved statistical significance. While the DotScan antibody microarray enables determination of new patterns of expression of known CD antigens, it is most effective when used in combination with proteomic discovery techniques, such as 2-dimensional gel electrophoresis and LC-iTRAQ-MS, to identify novel differentially abundant proteins. Such novel proteins are potential markers; corresponding antibodies could be added to the array, and validated with clinical CRC samples. The use of fluorescently-labeled antibodies to profile sub-sets of captured cells provides a powerful DotScan platform for analysis of mixed populations of cells. We thank staff at the Anatomical Pathology Laboratories of the Royal Prince Alfred and Concord Repatriation Hospitals for collecting fresh samples of CRC and normal intestinal mucosa. The work was funded by a Cancer Institute New South Wales Translational Program Grant. Steinert, R., Buschmann, T., vander Linden, M., Fels, L. M., Lippert, H., Reymond, M. A. The role of proteomics in the diagnosis and outcome prediction in colorectal cancer. Technol. Cancer. Res. Treat. 1, 297 (2002). Eifel, P., Axelson, J. A., Costa, J., Crowley, J., Curran, W. J., Deshler, A., Fulton, S., Hendricks, C. B., Kemeny, M., Kornblith, A. B., Louis, T. A., Markman, M., Mayer, R., Roter, D. National Institutes of Health Consensus Development Conference Statement: adjuvant therapy for breast cancer. J. Natl. Canc. Inst. 93, 979 (2001). Swerdlow, S. H., Campo, E., Harris, H. L., Jaffe, E. S., Pileri, S. A., Stein, H., Thiele, J., Vardiman, J. W. WHO classification of tumour of haematopoietic and lymphoid tissues. IARC WHO Classification of Tumours. 2, Fourth, (2008). Xiao, G. G., Recker, R. R., Deng, H. W. Recent advances in proteomics and cancer biomarker discovery. Clin. Med. Oncol. (2008). Belov, L., Mulligan, S. P., Barber, N., Woolfson, A., Scott, M., Stoner, K., Chrisp, J. S., Sewell, W. A., Bradstock, K. F., Bandall, L., Pascovici, D. S., Thomas, M., Erber, W., Huang, P., et al. 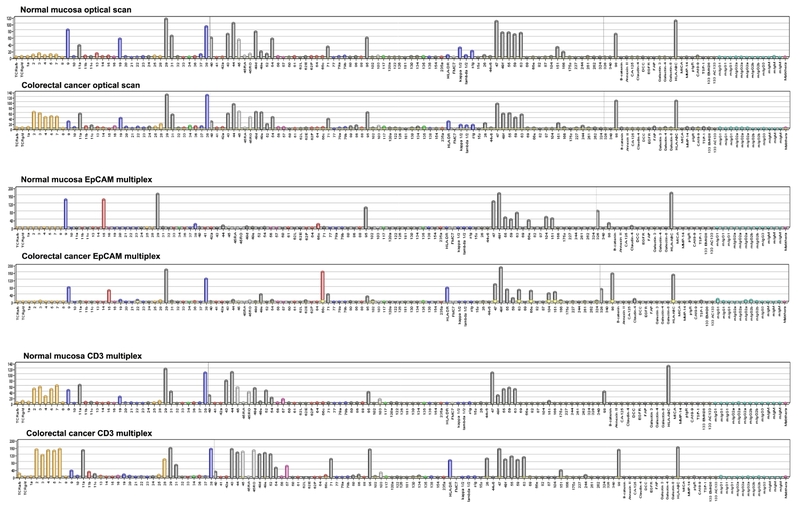 Analysis of human leukaemias and lymphomas using extensive immunophenotypes from an antibody microarray. Br. J. Haematol. 135, 184 (2006). Belov, L., Huang, P., Barber, N., Mulligan, S. P., Christopherson, R. I. Identification of repertories of surface antigens on leukemias using an antibody microarray. Proteomics. 3, 2147 (2003). Zhou, J., Belov, L., Huang, P. Y., Shin, J., Solomon, M. J., Chapuis, P. H., Bokey, L., Chan, C., Clarke, C., Clarke, S. J., Christopherson, R. I. Surface antigen profiling of colorectal cancer using antibody microarrays with fluorescence multiplexing. J. Immunol. Methods. 355, (1-2), 40-51 (2010). Ellmark, P., Belov, L., Huang, P., Lee, C. S., Solomon, M. J., Morgan, D. K., Christopherson, R. I. Multiplex detection of surface molecules on colorectal cancers. Proteomics. 6, 1791 (2006). Pearson, J. P., Allen, A., Hutton, D. A. Rheology of mucin. Methods Mol. Biol. 125, 99 (2000). Yang, Y. H., Dudoit, S., Luu, P., Lin, D. M., Peng, V., Ngai, J., Speed, T. P. Normalization for cDNA microarray data: a robust composite method addressing single and multiple slide systematic variation. Nucleic Acids Res. 30, 15 (2002). Al Saeed,, et al. TMA: A free, open-source system for microarray data management and analysis. BioTechniques. 34, 374-378 (2003). Posted by JoVE Editors on 07/03/2015. Citeable Link.